CAMARILLO, Calif., Jan. 16, 2019 ― Semtech Corporation (Nasdaq: SMTC), a leading supplier of high performance analog and mixed-signal semiconductors and advanced algorithms, announced that it will be the Platinum sponsor of the upcoming The Things Conference, as well as providing several speakers to present on its LoRa® devices and wireless radio frequency technology (LoRa Technology). 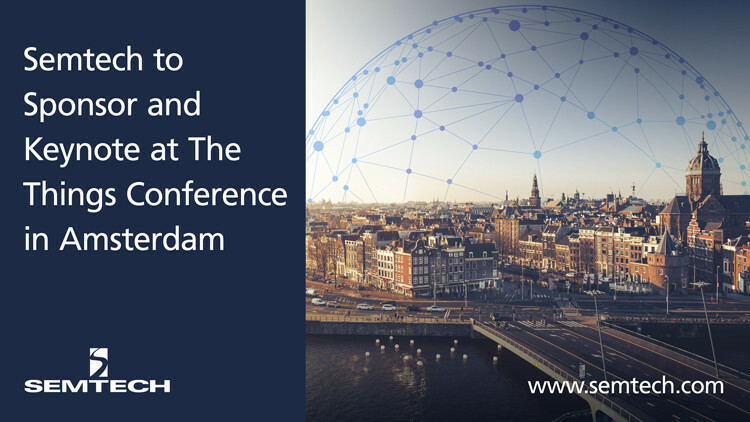 The conference is hosted by The Things Network (TTN) in Amsterdam from January 31 through February 1, and is expected to be the largest LoRaWAN™-focused conference of the year. Richard Lansdowne, Sr. Director of Cloud Services in Semtech’s Wireless and Sensing Products Group, will review how Semtech leverages services to break down the complexities of bringing key solutions to a broader audience, lowering the barriers to entry as well as the costs.